Dextran-chitosan blend added with ammonium thiocyanate (NH4SCN)-based solid polymer electrolytes are prepared by solution cast method. The interaction between the components of the electrolyte is verified by Fourier transform infrared (FTIR) analysis. The blend of 40 wt% dextran-60 wt% chitosan is found to be the most amorphous ratio. The room temperature conductivity of undoped 40 wt% dextran-60 wt% chitosan blend film is identified to be (3.84 ± 0.97) × 10−10 S cm−1. The inclusion of 40 wt.% NH4SCN to the polymer blend has optimized the room temperature conductivity up (1.28 ± 0.43) × 10−4 S cm−1. Result from X-ray diffraction (XRD) and differential scanning calorimetry (DSC) analysis shows that the electrolyte with the highest conductivity value has the lowest degree of crystallinity (χ c) and the glass transition temperature (T g), respectively. Temperature-dependence of conductivity follows Arrhenius theory. 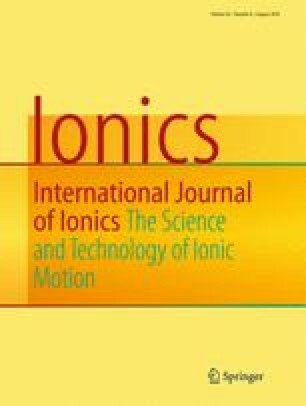 From transport analysis, the conductivity is noticed to be influenced by the mobility (μ) and number density (n) of ions. Conductivity trend is further verified by field emission scanning electron microscopy (FESEM) and dielectric results. The authors thank the University of Malaya for the grant FP009-2015A and RP010B-13AFR awarded.